According to the United Nations, “Obtaining a quality education is the foundation to improving people’s lives and sustainable development. 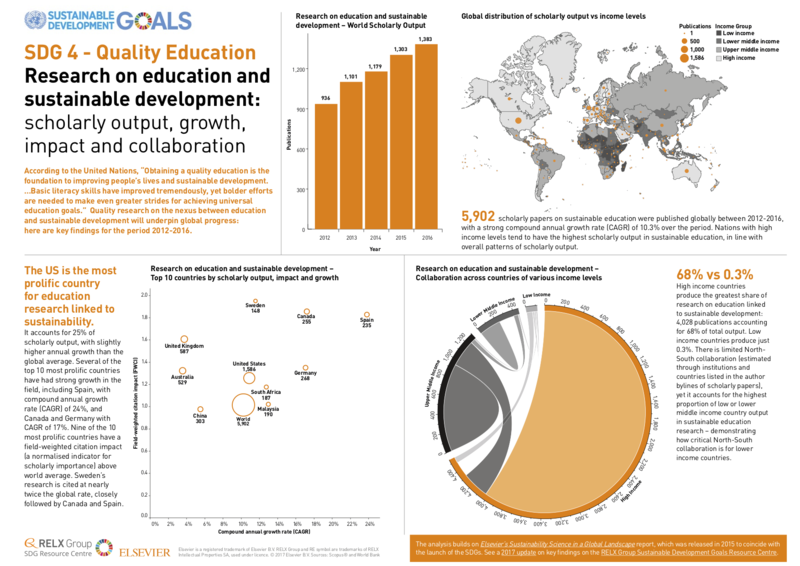 …Basic literacy skills have improved tremendously, yet bolder efforts are needed to make even greater strides for achieving universal education goals.” Quality research on the nexus between education and sustainable development will underpin global progress. This latest analysis builds on Elsevier’s Sustainability Science in a Global Landscape Report, which was released in 2015 to coincide with the launch of the SDGs. The analysis shows, for the period 2012-2016, worldwide scholarly output for research linking education and sustainable development, and the related impact, growth and collaboration between researchers in the Global North and Global South.